May 20th, 2008 : Rain and cool, Water temp 66* and Stained. Got out on the water early and caught Herring and Gizzards and picked clients up at 5:30am. Set up a dozen free lines and 3 down lines on a main lake flat and pulled boards over 20 flats and points. By 8 we had only 1 Striper in the boat so I decided to make a move to down lines over deeper flats where I found schools of Stripers. We started getting hits immediatly and continued to till we ran out of bait. We went and caught more bait and set up on another deep flat with no luck there. 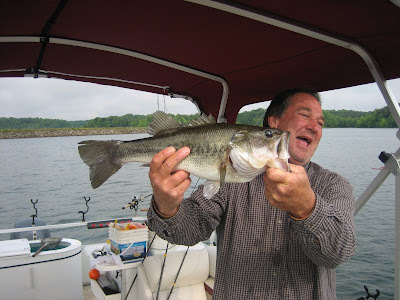 James is holding a Bass he caught on a downline. 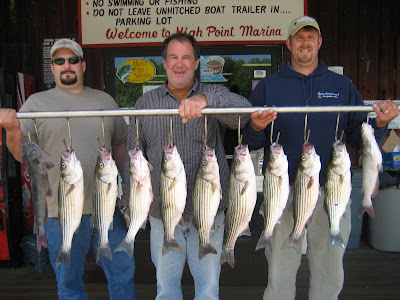 Today we had close to 100 hits, catching Stripers, Bass and Catfish.